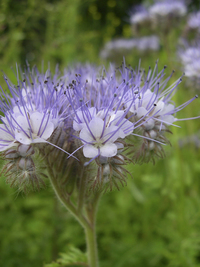 Cultivated originally as a honey plant, this native California wildflower is now used widely as a beneficial insect attractor and cover crop. Breaks down rapidly after incorporation for quick nutrient release. Winter kills at about 18 °F, leaving behind a weed smothering biomass that prepares no-till beds for early spring transplants (most effective from an August 1 sowing around here). May be sown from early spring onward as bee forage, for insectary field borders and intercropping strips. Beautiful lavender-blue flowers unfurl from fiddlehead cymes, and are constantly visited by pollinators and nectar lovers of every kind. Used for cut flowers all season long.